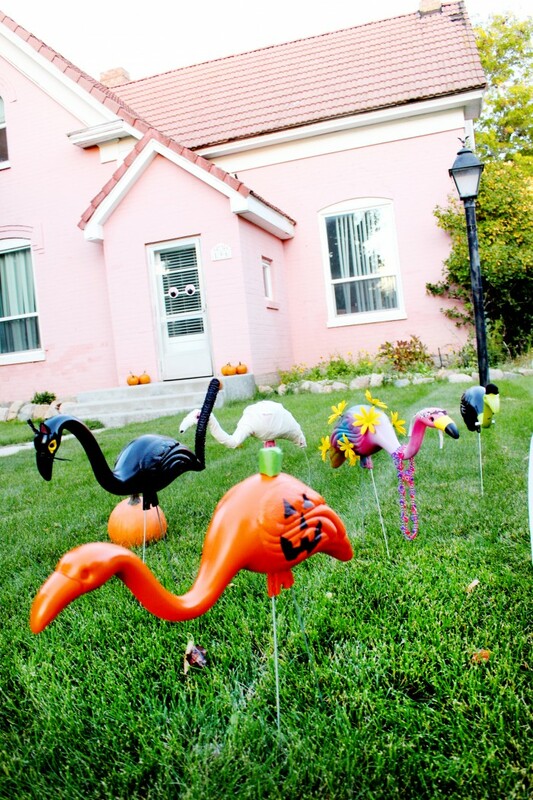 DIY Lawn Flamingos in Halloween Costumes! Eeeeeek! 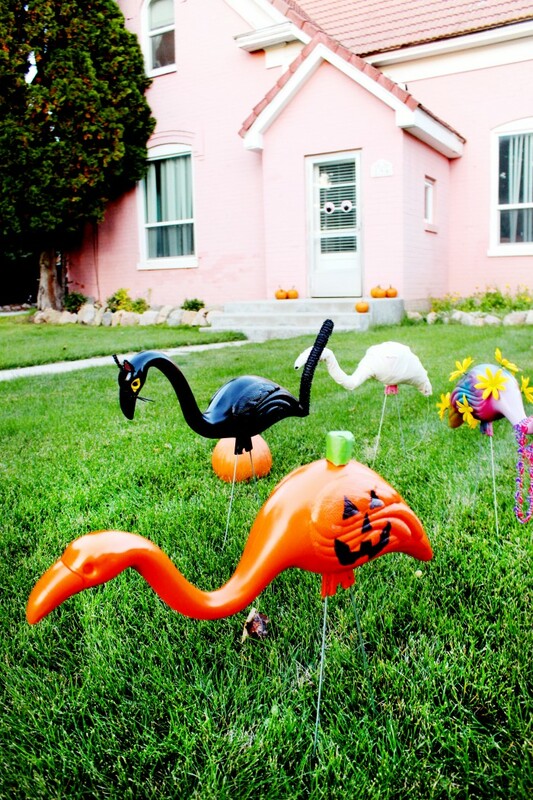 I am so excited about my newest Halloween decoration/the cutest little lawn flamingos I’ve ever seen/this post! haha, I sure hope this post makes up for the colossal break we’ve had since the last post. I kinda think it might….I mean..
Look at these little cuties! 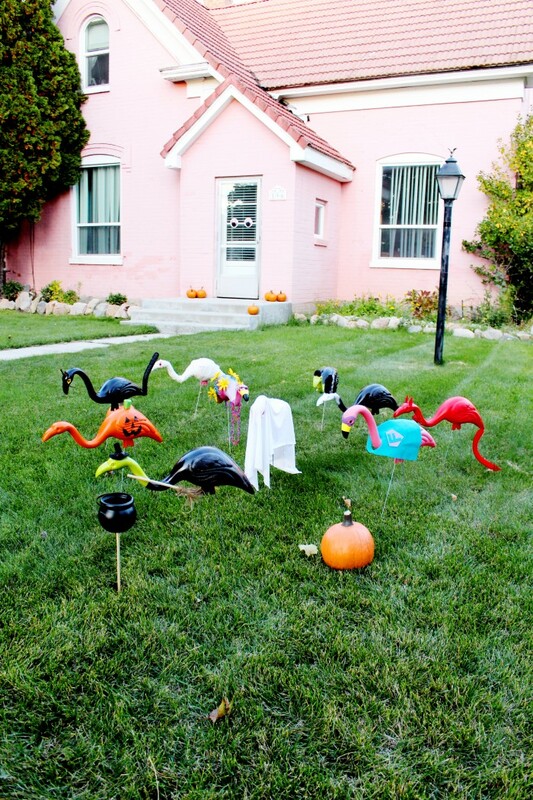 So last year I saw several people sharing around skeleton lawn flamingos and they were so awesome! 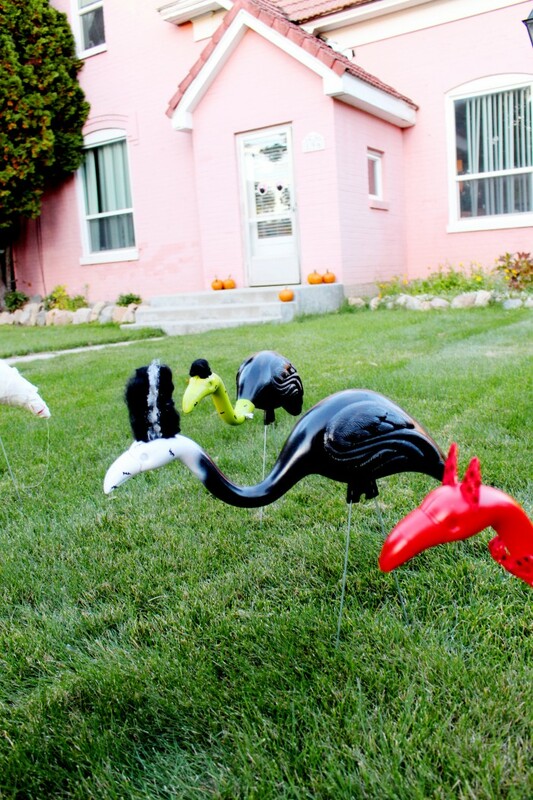 I was thinking how cool it would be to have a whole fleet of them in my yard for Halloween. But then, I thought “why not make them all into different Halloween-themed things? 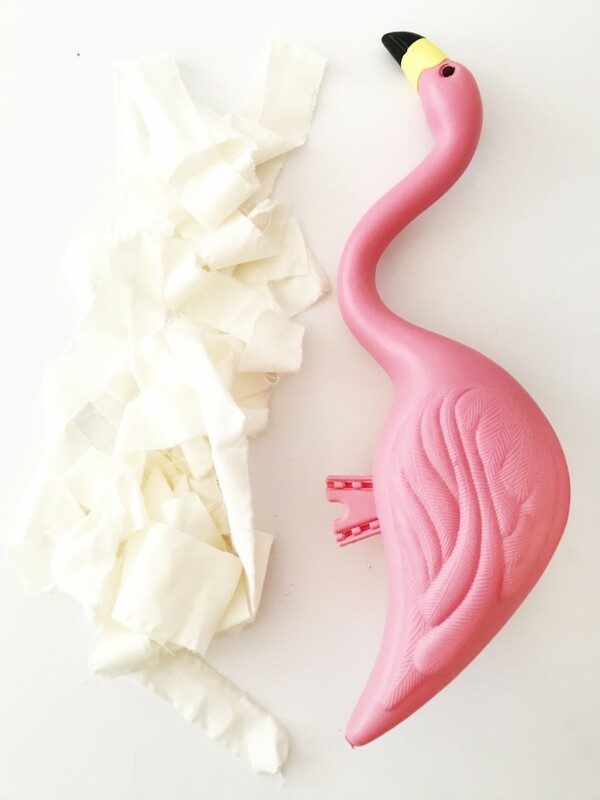 !” A flamingo can dress up just as good as a human can and I believe this post proves it! And in the end, I didn’t even make a skeleton haha! 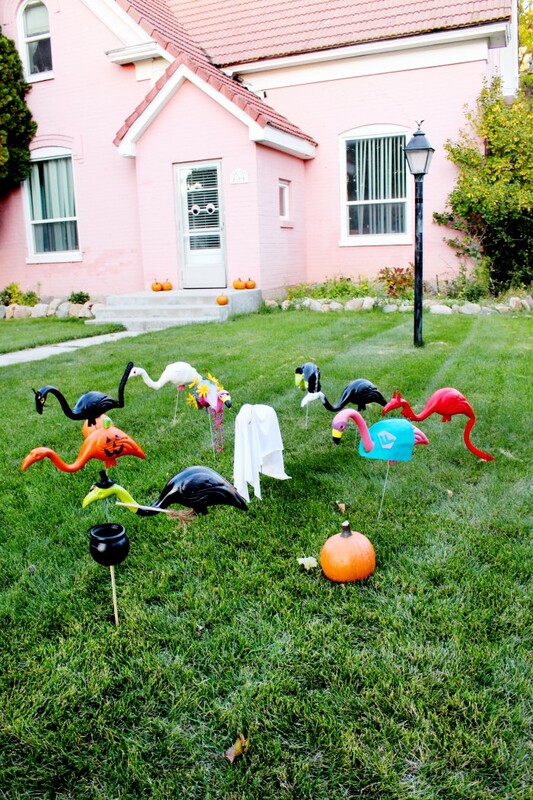 Honestly, it seemed like more work than I wanted to do and I wanted to put out a wholly unique set of Halloween lawn flamingos. So! 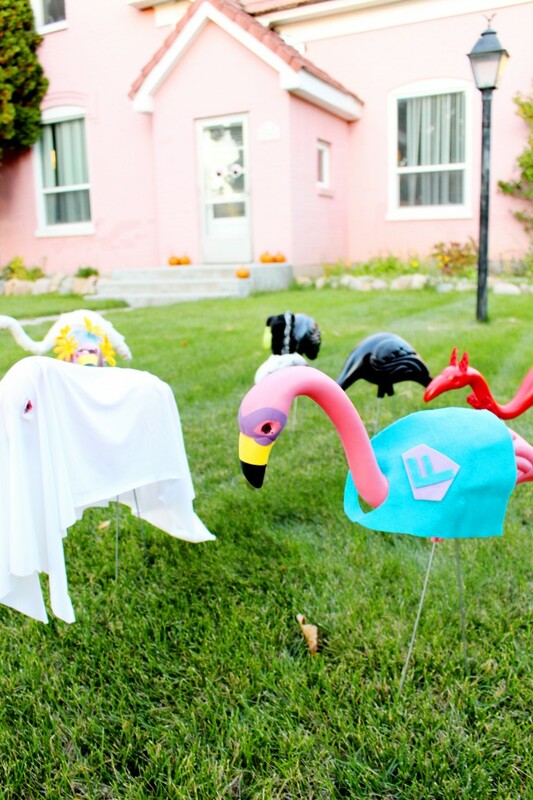 We have a black cat, a ghost, a devil, a mummy, a superhero, a witch (probably my fave! ), a jack o’ lantern pumpkin, frankenstein, bride of frankenstein, and a hippie (ok, maybe this one is my fave!). I’m pretty enamored with these little guys! 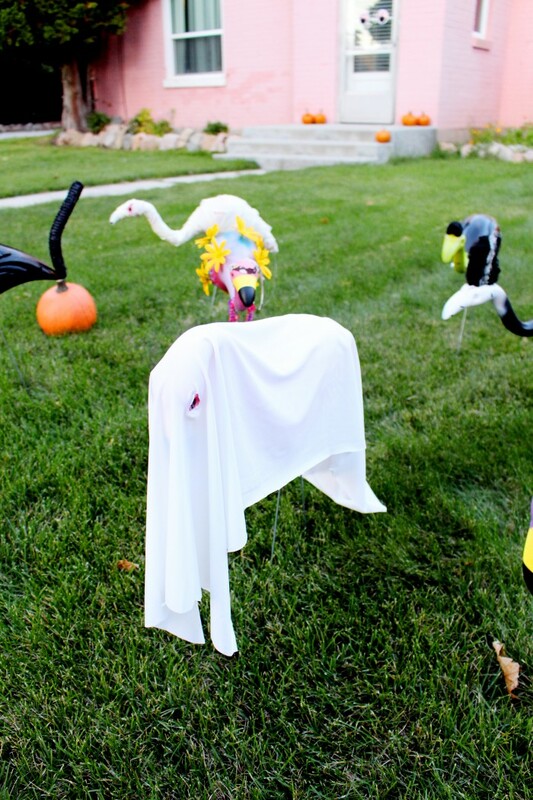 I think any one of them would be a great addition to anyone’s Halloween decor but the whole party of em is pretty dang fun, wouldn’t ya say?! 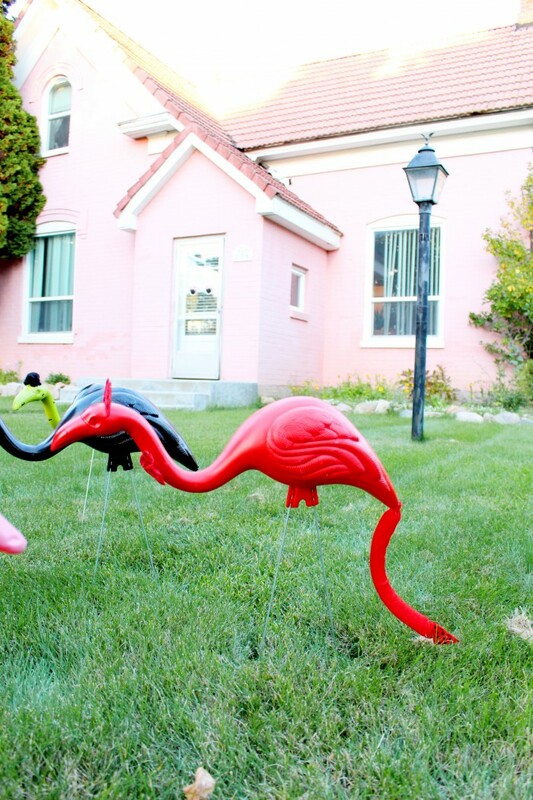 I grabbed this set of 10 flamingos from Home Depot, right here. Instructions (and closeups!) 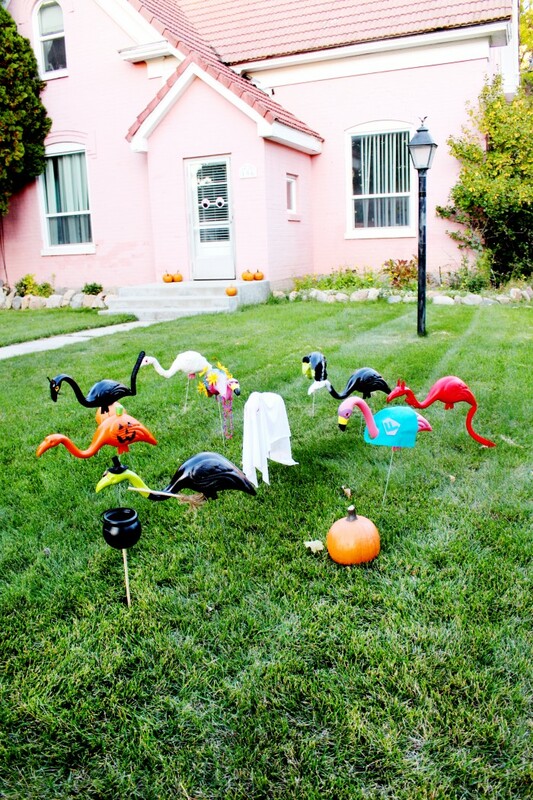 for each flamingo is given below. Not included in all the materials lists is a hot glue gun (I used it on every one). Color in the pupils black with a marker. 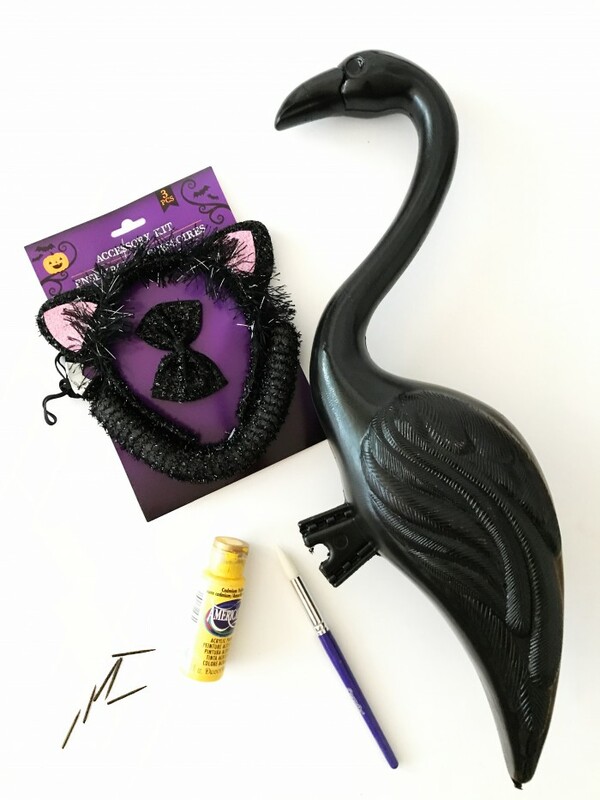 I found this awesome cat accessory pack at Dollar Tree but you could easily make your own ears and tail from felt. I cut the ears down quite a bit and attached with hot glue. 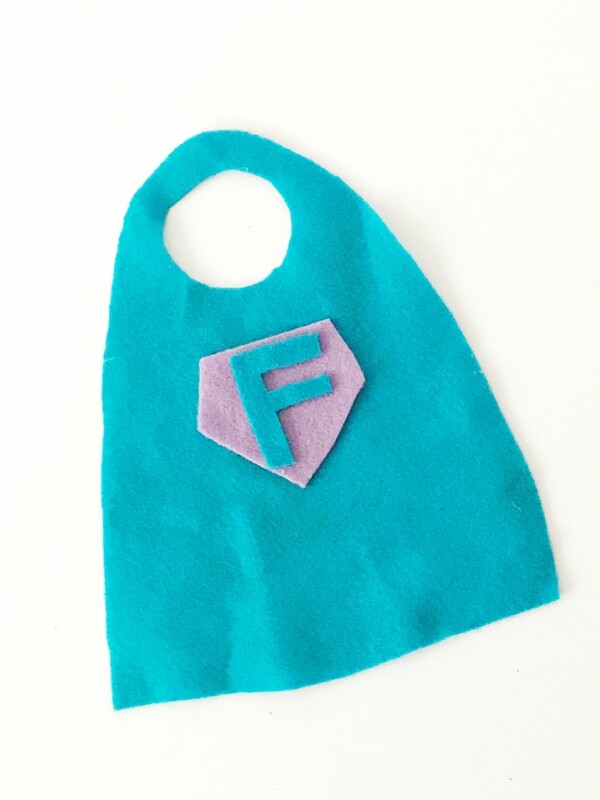 Attach tail with hot glue too. 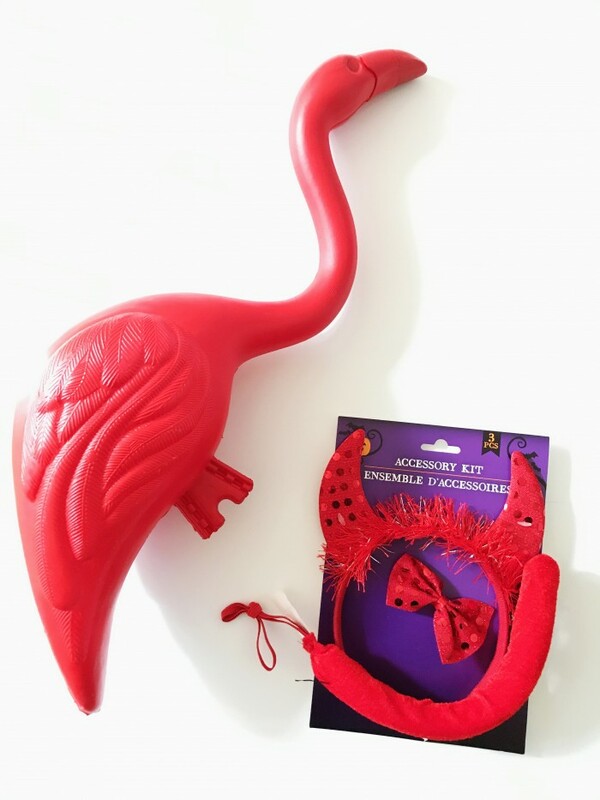 I nabbed this great set of pre-made devil accessories from Dollar Tree. 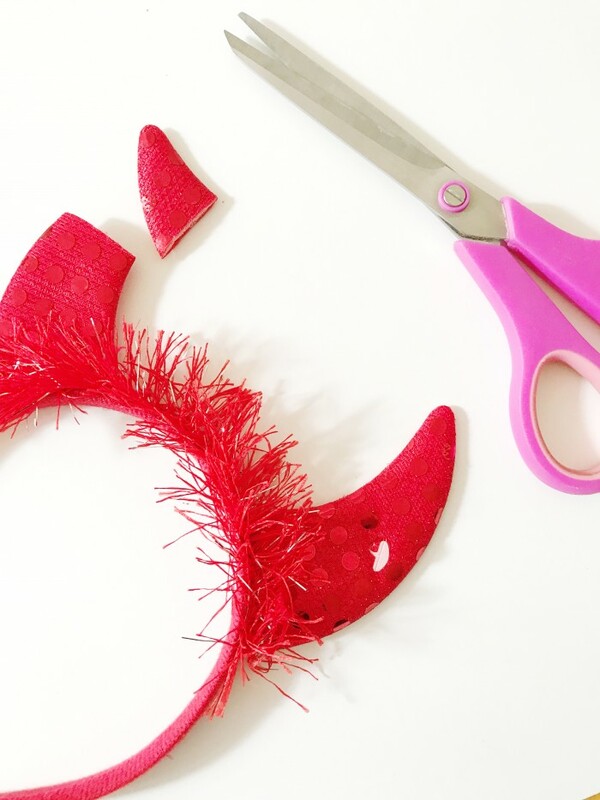 But you could easily make little horns and a tail from red felt. I cut the horns down a lot smaller. 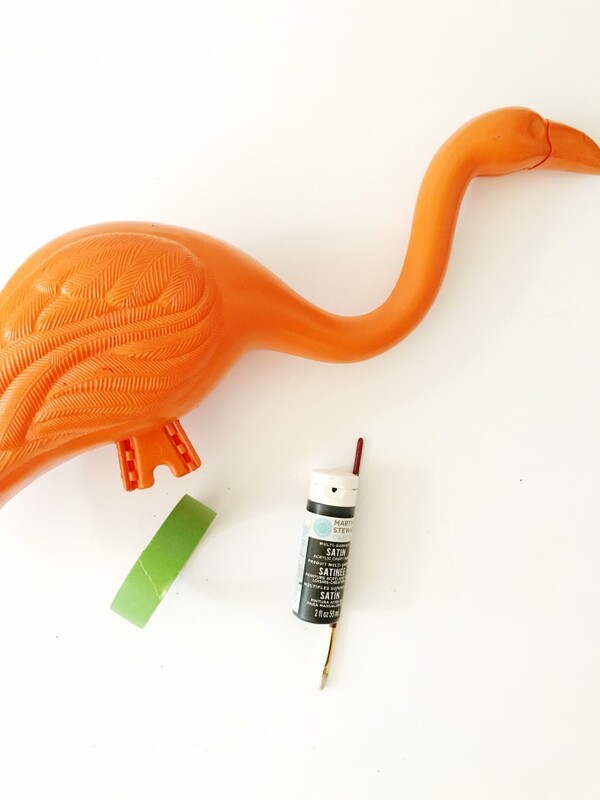 Attach accessories to flamingo with hot glue. 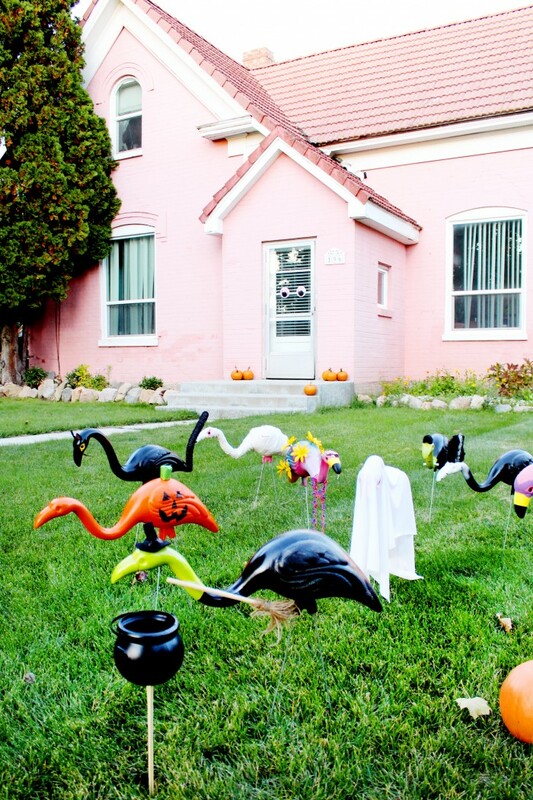 Use a black permanent marker to draw a classic Jack O’ Lantern face on each side of the flamingo. 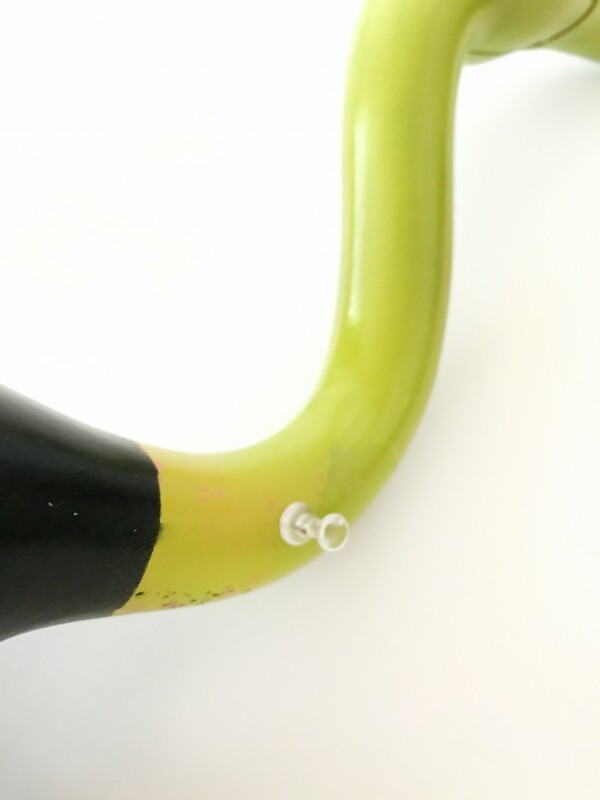 I used green painters tape to just make a little stem and hot glued it on. You could paint any small cylinder green. Paint body black without worrying about taping off (unless you want to). Use black marker to make “stitches” around face and neck. 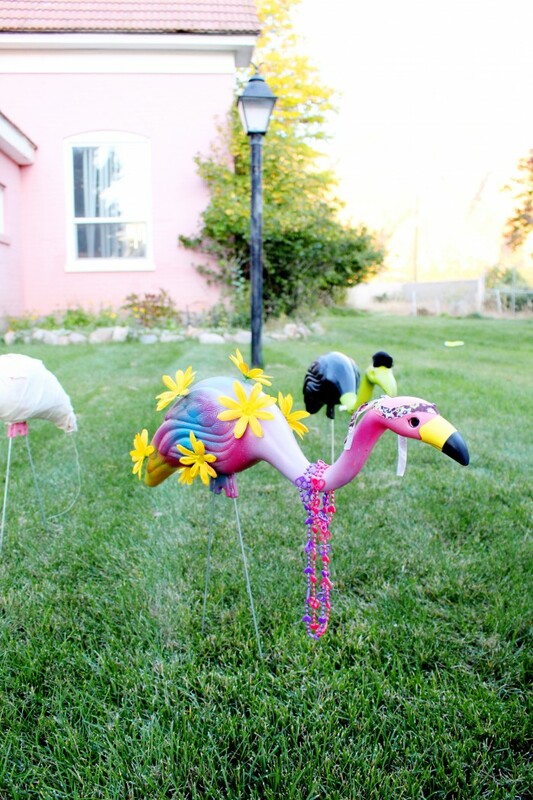 Spray paint flamingo in a tie dye type pattern with some fun colors. It was much easier to do this than I thought it would be, just spray in random places with colors like purple, turquoise, green, yellow! 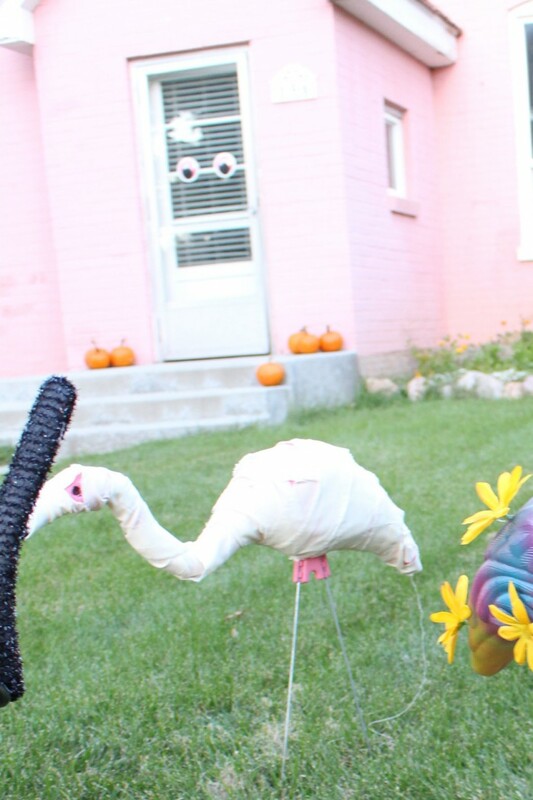 Pull off fake flowers and attach randomly all over flamingo with hot glue. 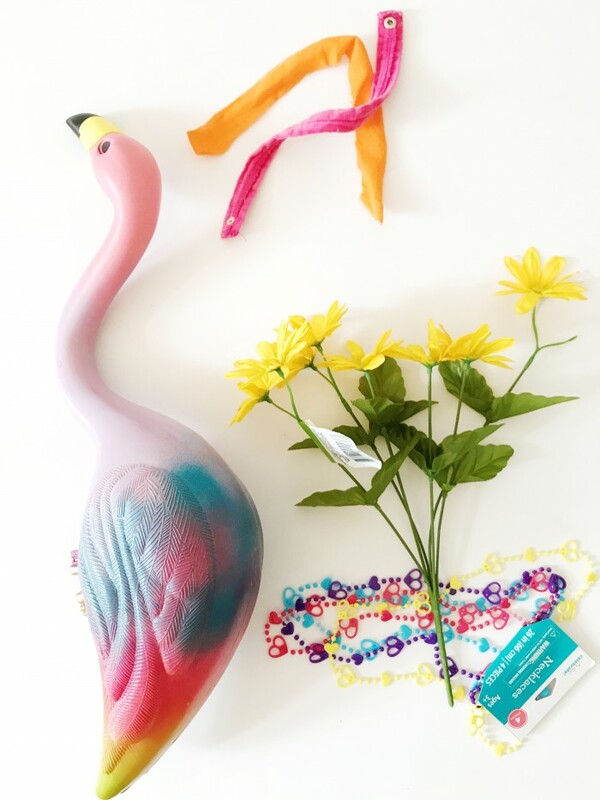 Hang peace sign necklace/s over the flamingo’s neck. Attach a tied strip of floral fabric around head with hot glue. 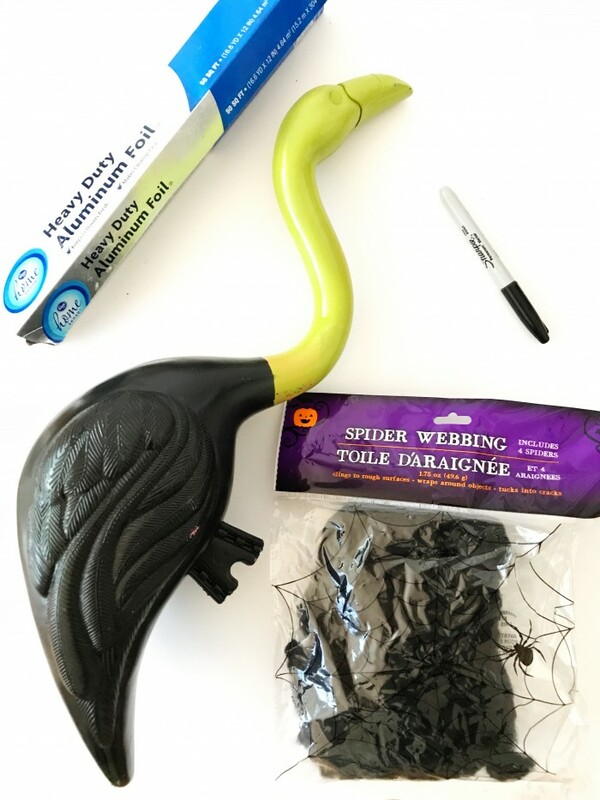 Wrap around flamingo, attaching with hot glue. 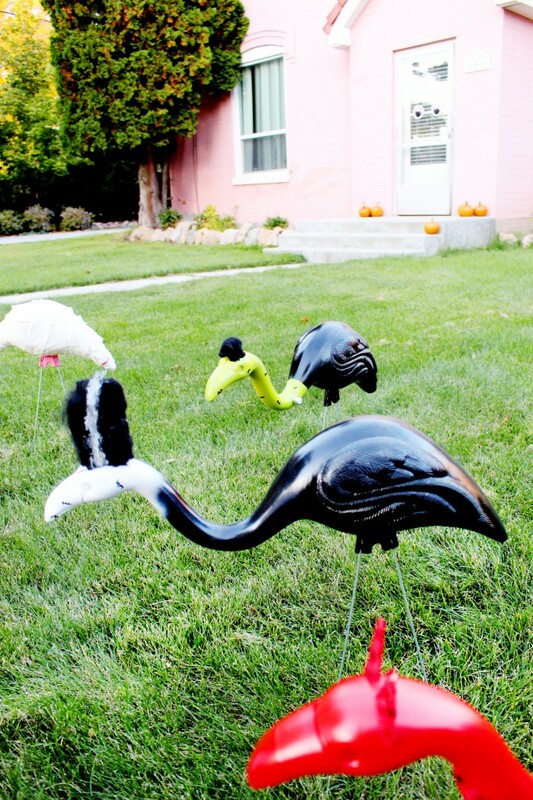 Spray paint flamingo head green. When dry, tape off at the base of the neck and spray paint the body black. 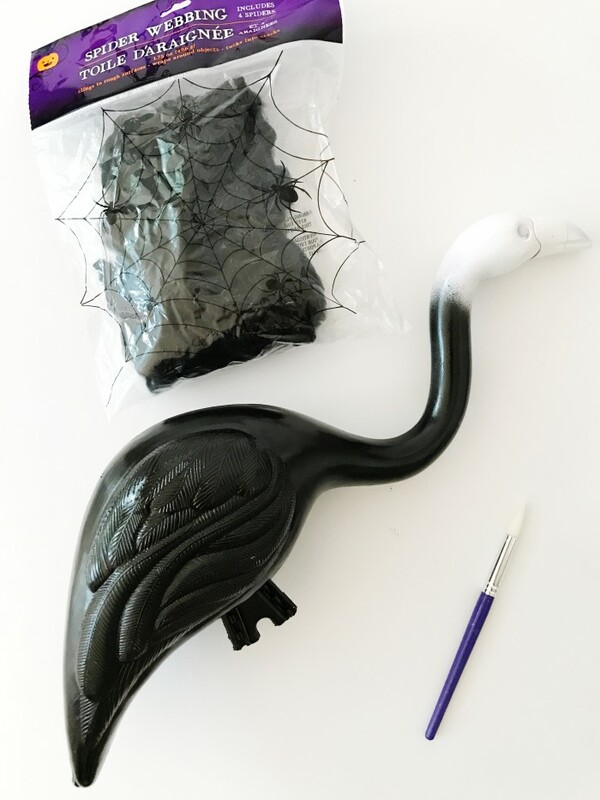 Make a little hair coif out of black spiderwebbing and hot glue onto head. Push pins into the neck. Cover push pins in aluminum foil. Draw random stitching on Frankenstein’s face and neck. 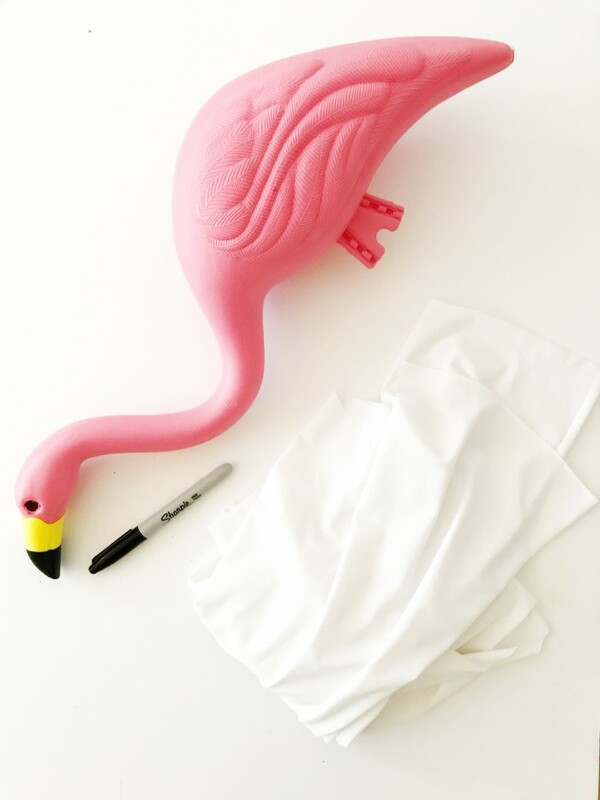 Cut white fabric the right length for it to drape over the flamingo. 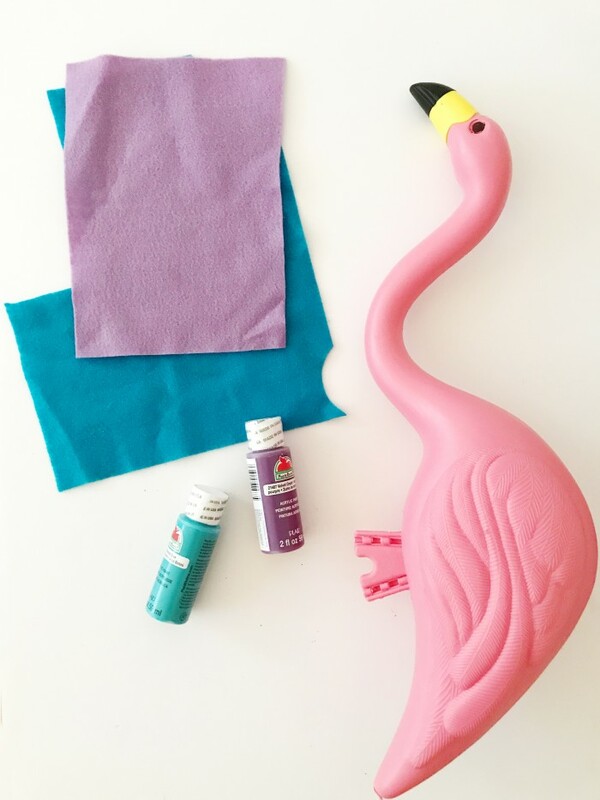 Attach fabric to flamingo with hot glue. 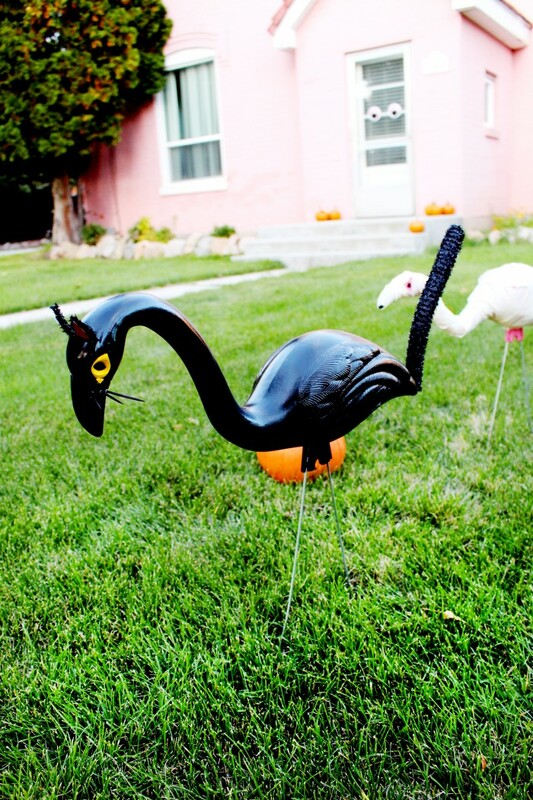 First spray paint the head of the flamingo green. Tape off around the neck, then spray paint the rest of the body black. 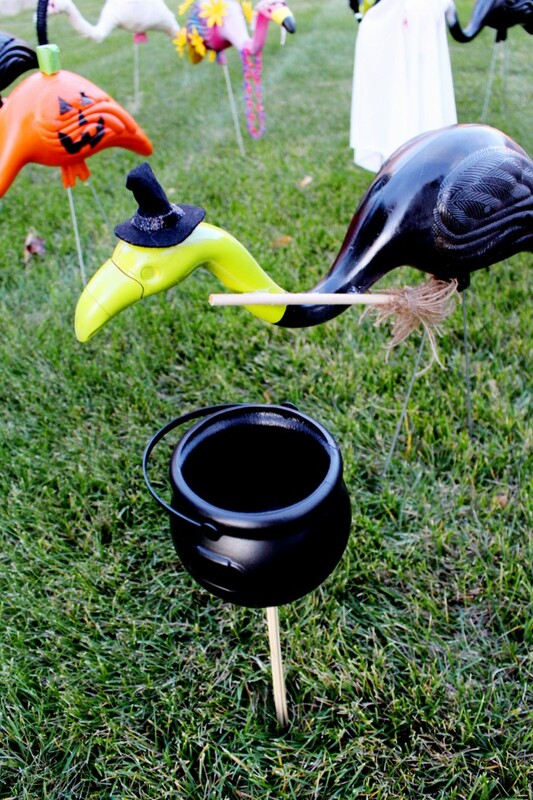 Make a mini broom with twine and mini dowel. 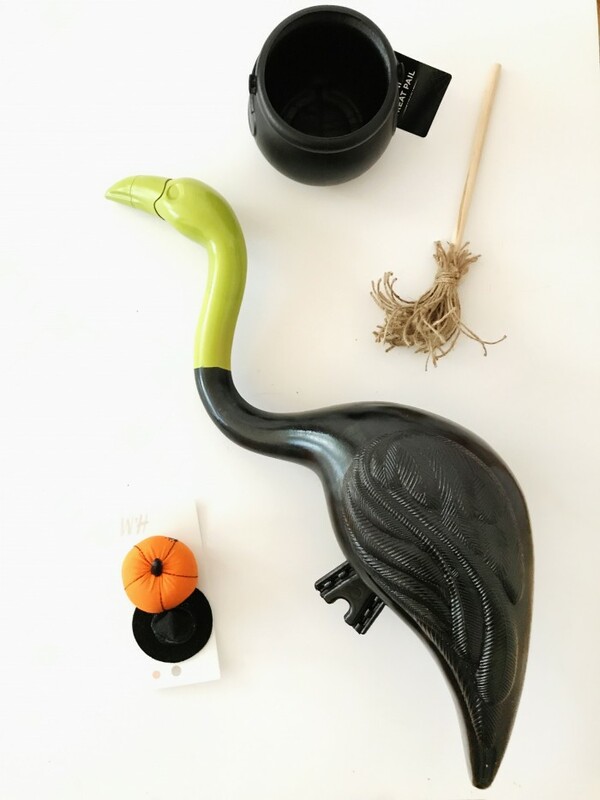 Hot glue mini witch hat onto flamingo head. Hot glue mini broom into place on its side. I found the mini cauldron at Walmart. So which one is your fave? !